Specific promotion works. Vague promotion fails. What I found EVERY SINGLE TIME is that when an anchor directed the TV audience to visit the website to accrue some sort of specific benefit: a longer video interview with the police chief; all the high school football scores; address of that awesome new Italian restaurant, et al, traffic went up considerably and immediately. But, when an anchor said something amorphous like “get more information on our website, azfamily.com” traffic didn’t spike at all. I’m glad I tested this proposition, and have the spreadsheets to prove the findings. But in reality, I shouldn’t have had to test it, and neither should you. If you don’t tell people WHY they will benefit personally from taking an action, they typically WILL NOT take that action. The notion that your audience will instantly self-motivate and “connect the dots” is a fallacy, and it always has been. After watching the news for just one day, the viewers know you have a website. Maybe they’ve even visited it. WHY should they go back? Unfortunately, I see the same patterns unfolding with social outpost promotion. Scores of ads, signs, email newsletters and other communiques now contain the iconography of Facebook and Twitter – two mediocre logos standing like little sentries in the right hand corner, vigilantly guarding against notions of the company in question being unhip and out of touch. 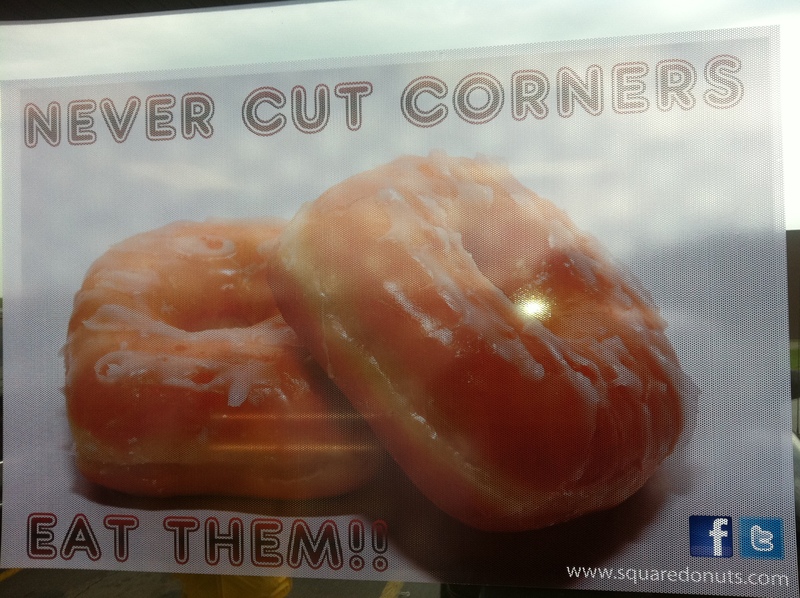 Here’s an example from Square Donuts, a local chain of fried dough emporiums based here in Bloomington, Indiana. The large sign in the front window includes the ubiquitous Facebook and Twitter icons, listed above the website address for the company. Why exactly do I care that they are on Facebook or Twitter? What will happen if I visit the social outposts of Square Donuts? Consumers are staring up a mountain at an oncoming Invitation Avalanche, as companies of all shapes, sizes, and iterations fight for followers and friends. If your company wants to cut through that clutter, an icon is simply too dull a knife to do so. Nope. I am not the Facebook page for a donut store. Instead, the correct Facebook page for the business is Facebook.com/SquareDonutsBTown, which is considerably less intuitive. On Twitter, the @SquareDonuts handle is mysteriously some sort of evil donut spam bot. The business’ actual Twitter name (which took some digging to find) is @SquareDntsBTown which is complicated, abbreviated, and truncated (since they’ve never tweeted from it). I’m not sure why you would use sign space to promote a Twitter account from which you’ve never tweeted? 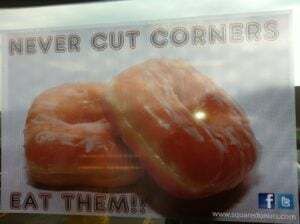 The good news is that the donuts are indeed square, are flat-out amazing, and (local tip) are just 25 cents every day during happy hour from 1pm – 2pm. For an example of how to better promote social outposts, I stumbled upon a sign in an inter-terminal train at the Minneapolis airport. For some reason, this place is my aeronautical muse, as this is the third post I’ve written based on stuff I’ve seen at MSP. Yep. Doing it right at MSP. That’s how to do it. The fact that the AIRPORT is on Facebook isn’t consequential for me. But, considering I fly through MSP quite a lot with long-ish layovers, special deals from shops and restaurants is potentially worthwhile. Also, MSP does a great job on this sign of showing travelers flummoxed by train mechanical failures specifically where to find the airport on the social Web, taking the trouble to list out: facebook.com/mspairport twitter.com/mspairport and youtube.com/user/shopsatmsp. 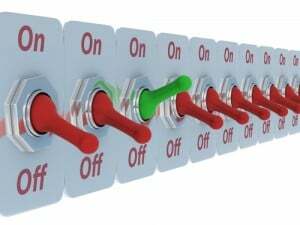 If you’re going to promote your social outposts (and hopefully the considerable time you’ve invested creating and maintaining them make promoting them a given), please take the time and make the effort to promote specific benefits. Remember, in a world where every company has a special offer, what makes yours so special? Get specific to get results.